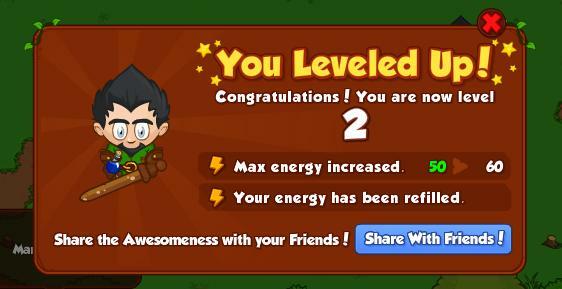 DJarts Games' newest venture on Facebook Bush Whacker 2 is an adventure puzzle game sequel to Bush Whacker. Dress up your avatar, whack bushes and creatures, collect items and solve puzzles all by the hand of your wide-eyed little bush whacking friend. Fans of the original Bush Whacker game can expect to see many familiar faces like; Steve the Fisherman, Annie, Ralph as well as game content, gems, collectibles, costumes, creatures, furniture and more. As well as all new content such as; trinkets, progress bars and quests, etc. You start the game off, ship wrecked on a strange island, venture inland to find a group of friendly villagers that help show you the ropes of Bush Whacker and offer you rewards in exchange for completing quests and tasks. Begin your journey by learning the art of bush whacking, taking your trusty wooden sword shred an idol bush and collect what ever it leaves behind, could be coins, gems, potions, costumes, puzzles pieces or any combination of the aforementioned possibilities or could be nothing at all. Power attack is your next skill to learn. 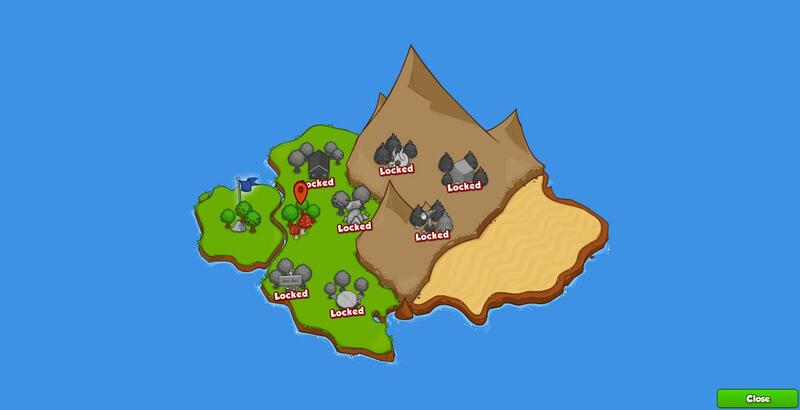 Use power attacks by first collecting power potions from defeated bushes/creatures, power potions are orange and act as a multiplier so 10 power attack used on a tree that would have dropped 5 coins, would now yield 50 coins (10 X 5 = 50) but if the tree drops nothing, you would get 10 of nothing so there is a luck factor. Mana Whack is next, this is a lightning attack that consumes not energy but instead mana which is blue and is also obtained from defeating bushes/creatures in the same manor as power potions. 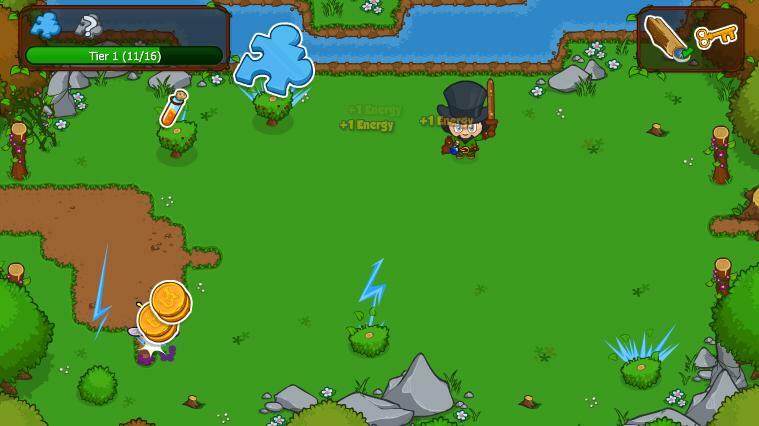 As you progress through the game you will be able to upgrade your mana whacking power and use it to destroy higher level targets (which require more energy) but as the mana whack power increases the mana cost increases as well. 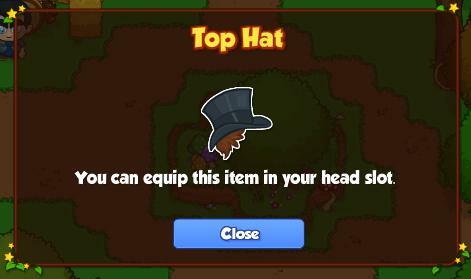 General Items - The everyday things; coins, plants, furniture, costumes, etc. Key Items - Items needed to complete quests/challenges in order to move onto the next stages. Trinkets - Powerful items that grant bonuses, such as; better loot chances, faster running, increasing max energy. Reaching higher levels unlock additional Trinket slots to be used. Gems - Obtained through defeating bushes/creatures, quests, rewards, etc. Used as currency, similar to gold, ranging in value. Agate is the lowest quality gems. Aquamarine is worth four Agate. Citrine is worth four Aquamarine. The highest quality gem is worth about 260,000 Agate. You can exchange gems with one of the towns people from the beginning of the journey. Is capable to transporting your character to any already discovered areas with one click, free of charge. Summarizes area completion percentages for easy review. Bush Whacker 2 seems to me like an amusing application but it feels like nothing short of a revamped original Bush Whacker, if this is the case than why go through the trouble of redoing an app that was doing well and stick with it. Perhaps Bush Whacker had some technical issues that would have been just as much or even more trouble to resolve so DJarts decided to go ahead and launch a whole new application while maintaining the name and image. If the reason for a Bush Whacker 2 is known I would be interested in learning what is was. Although Bush Whacker 2 has many notable similarities to those present in the original Bush Whacker, the sequel does have it's own unique components and personality. Also I expect the developers to maintain both versions in the short term, which adding more content and updates to BW 2 and in the long run possibly tune BW or attempt to incorporate the accounts of BW into BW 2 if at all possible. But at the end of the day I would put my money on Bush Whacker 2 to outlive its predecessor. Creature supposedly have a better chance of dropping energy refills so consider using your power attacks on whacking creatures because big energy refills are the most valuable loot you can hope for. Use your power attack when the power bar is at around 20-40% because if you use too little the multiplier will not give any significant rewards and if you use it with too much power any and all excess in the event of potions will be lost. Choose your trinkets and other bonus effect items carefully, for example ones that give higher chance of finding potions and energy or that decrease the chance of finding nothing. If you are lucky enough to loot sufficient amounts of potions and energy you could just keep going around and around with the right luck and well managed resource distribution. Check for any quests you're able to start before going to whack bushes, because a lot of the time the quests involves finding loot in an area you are about to hunt in and finding the quest items will let you finish the quest sooner and also gain additional experience from the energy you are about to use. NEVER use a power attack with only one power in the meter, because it will have no effect. When using Power attack, use it on a target that has the highest level, because the difference in energy consumption might just be a few points but the rewards will be better by a great deal. When casting Mana Whack, use it in an area that has opponents equal to the Mana Whacks level. Because every area has six opponents (excluding special areas that have less), Mana Whack hits all opponents and costs the same amount of mana no matter the case. Opponents that are a higher level than Mana Whack will not be defeated thus the Mana Whack will destroy less than six opponents are yield diminished rewards.